Below is another card I did using some of the same colors in the last project I posted. Again I used the turquoise cardstock and scrapbook paper. I prefer to decorate not only the outside of the card, but also the inside and back. You can see below what the card looks like front to inside to back. A blue butterfly welcomes you and a blue bird waits for you at the end. The inside of the card has a retro-modern patterned turquoise border. Kraft paper is centered for writing senitments and signing your name. A small tag is "stiched on" and another tag dangles with birthday sentiments. This is fun because the birthday greeting pops out as the card is opened. The back of the card is embellished with stamped images ﻿and pen for fun. Over the last year and a half and we have experienced several sorrowful events. My father in law passed a little under a year ago, my neighborhood was ravaged by tornados and over the last 2 months I have lost two grandparents - my grandmother Thanksgiving weekend 2011 and my grandfather about 2 weeks ago. Due to traveling for the funerals, catching up with work, Girl Scout Cookie sales kicking off and fighting off the remnants of a cold, I am behind with blogging. I hope to catch up over the weekend! Winners from the recent giveaways will be posted this week. I also have some fun giveaways to post from Lovable Labels, Freeman, Cherrios, Pilsbury and Yoplait so keep checking back. 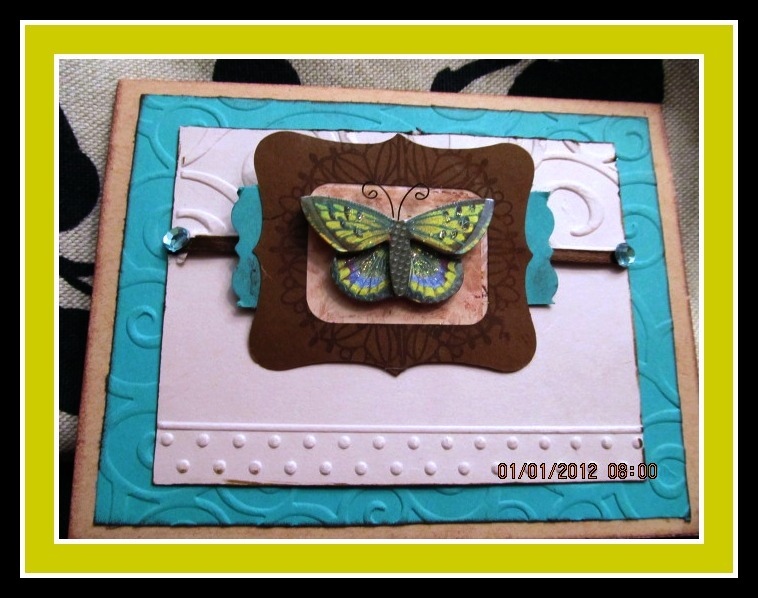 In addition, I will post a couple of new Card Projects to catch up. Thanks for continuing to visit and I hope to have many things to share in 2012!